There are three people I absolutely detest writing about: Miley Cyrus, Edward Snowden, and George Zimmerman. They are all famous for things that I personally abhor. Yet and still, they keep doing things to keep their names in news headlines. It’s like they all went to the Kim Kardashian School for Fame Whores. The most recent example of this shamefulness? 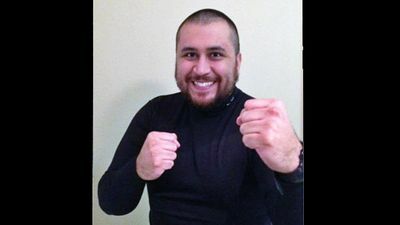 George Zimmerman is setting up a celebrity boxing match…for himself…because he’s a celebrity. Here’s how it’s all going to go down. If you want to be the lucky person to take on the Big Z in the ring, you have to contact him through a special email address. His team will pick an opponent and we’ll get to see them duke it out on pay-per-view. The proceeds go to charity. It’s that simple. I get that he is in a unique position. I’m sure not many are looking to hire Zimmerman, and now his face and name are major burdens for him. But this? This is wrong. It’s so wrong, and it reeks of desperation. And none of us should play into it. Sure, the idea of watching someone taking Zimmerman down a peg is tempting. It appeals to our collective sense if justice that is still wanting. But this whole charade is setup for Zimmerman’s benefit. He chooses his opponent. And the fight proceeds don’t line his pockets; it’s all about goodwill towards others. Right. Do we really want to help him overhaul his image after what he’s done? How morbid is it that he has chosen a violent sport as a means for income and retribution? During the trial, Zimmerman’s team tried their best to paint the confrontation as if Trayvon Martin was an aggressive dominating figure to which Zimmerman was defenseless (well except for his gun). They said Martin was on top of him and smashing his head into the concrete. His only recourse was to shoot, right? So, none of his boasted boxing talents came in handy during his confrontation with Martin? A teenager overcame all of his training? Some people really can have it both ways. But that’s not the worst thing about his announcement. The most disgusting part of it all is that Zimmerman’s infamy stems completely from the fact that he killed someone and got away with it. Why not exploit it? It’s so ripe for the picking. And the proceeds will go to charity, though I’m assuming that it won’t go the the Martin Family or any charity for murder victims. That’s a bit too “on the nose.” Not to mention that Zimmerman is desperate for any good press after the altercation with his girlfriend got him arrested a few weeks ago. I mean, everyone needs a hustle. And that’s exactly what it is, a hustle. And if there’s one thing it isn’t, it’s justice. If he won’t be getting any jail time, let’s at least make the life he has left as tough as it can be. And I’ll be damned if any of my hard earned cash goes to benefit his value of life. Are For-Profit Colleges Harmful to the Black Community?